To commemorate the sacrifices of the University of Toronto community during World War I, the university’s president, Sir Robert Falconer, called for the construction of a memorial in December 1918. Of the 5,308 staff, undergraduate, and graduate students who served in World War I, 12 per cent died while in service. The names of the 628 fallen have been engraved on the memorial tower, constructed from 1919 to 1924, with funds raised with the help of the Alumni Association in response to Falconer’s call. The clock and carillon — the bells of the tower — were installed in 1927, and the music of the bells has become a centrepiece of the annual Service of Remembrance at U of T since 1924. 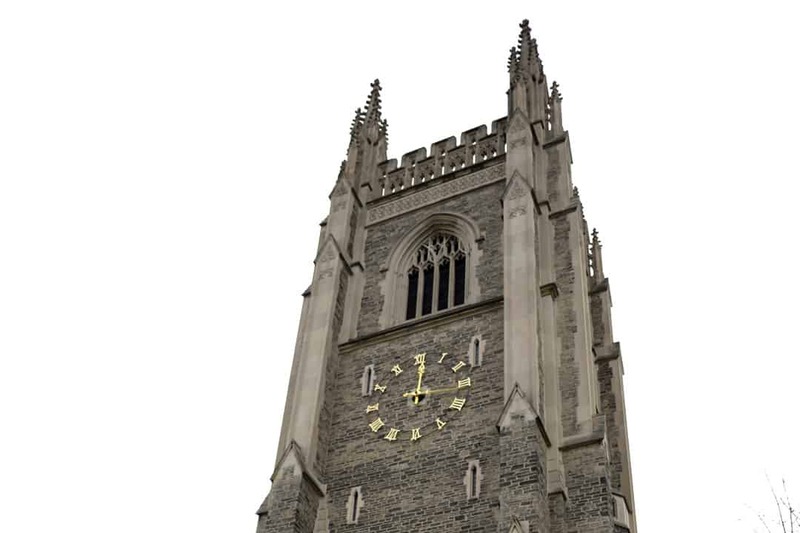 But the 51 bells of the tower are not played automatically — at the top of the tower, unseen each year by the people attending the service, a musician presses the keys of a piano-like instrument connected to the bells to create the music for the ceremony. Mateusz Olechnowicz, a graduate student of mathematics at U of T, first became drawn to the music from the bells in November 2015, while singing at a Service of Remembrance in a choir. While the sounds from a carillon are distinctive, the layout of a carillon’s keyboard is comparable to a piano’s, explained Lee during a rare public tour of the Soldiers’ Tower. “If you play piano or organ, you’ll recognize this keyboard set-up,” said Lee. He explained how two layers of batons act like keys – with “white keys on the bottom, black keys on top,” and a similar “pedal board” for operation by foot. 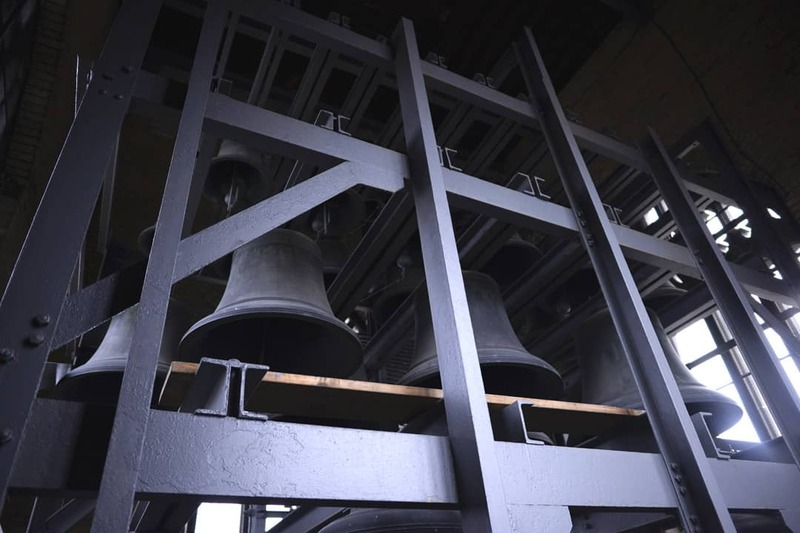 Each baton is wired to one of the 51 bronze bells at the top of the tower, which, as a whole, enables the carillonneur — the carillon player — to hit notes in a range of over four octaves. When a carillonneur presses down on a baton, explained Lee, a 500-pound free swinging metal ball called a clapper strikes the inside of the bell, sounding a note. “The pedals down here,” added Lee, motioning toward the pedal board, “replicate the bottom half of the keyboard.” A musician can thus strike the same bell either by pressing on a baton on the keyboard’s bottom layer, or by pressing a foot pedal near the floor. Even if a musician tries to play the carillon softly, the massive size of the bells causes reverberations across campus. This is a drawback for carillon students, explained Lee. Out of respect for students attending classes, carillon students spend most of their time playing on a practice carillon. In this layout, each baton connects to a rubber mallet that hits a pipe, rather than a clapper that hits a bell. This causes a carillonneur to feel “very little resistance” when pressing the batons of a practice carillon, compared to “quite a bit of resistance” when pressing those of a performance carillon, explained Lee. “The lack of playing time is probably the biggest challenge for students,” continued Lee. 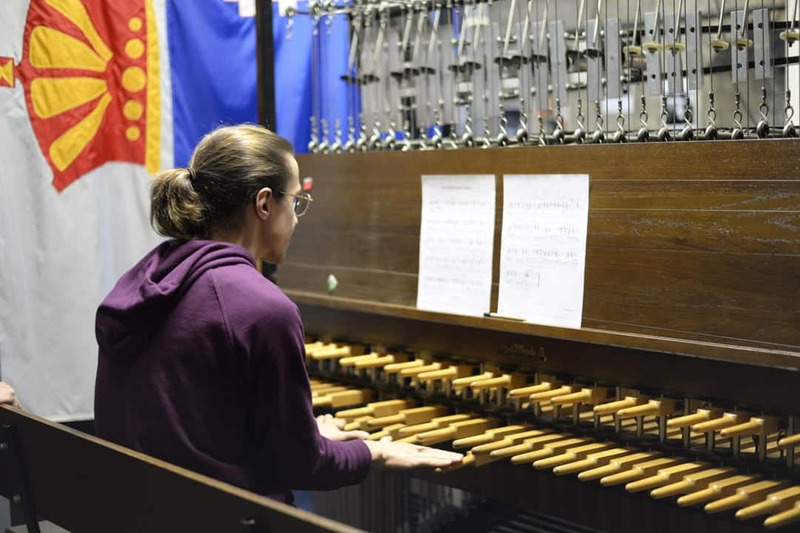 A limitation of practice time on the carillon is set by the university out of respect for the people living and taking classes around the Soldiers’ Tower. Usually only two to four students can learn from Lee at a particular time, to account for the limited practice time available to the carillonneurs. To overcome this challenge, they also arrange to practice on the performance carillon at the Metropolitan United Church, explained Olechnowicz, and think of ways to improve performance while away from their instrument. Coordination between hand and foot movement poses another challenge to successful performance, explained Naoko Tsujita, a percussionist who’s been a yearlong student of Lee. To increase the fluidity of her performance, Tsujita has “tried to play as many times as possible” over the past year, while also recognizing that improvement with the instrument is a “really, really slow process” that takes a great deal of practice time. But to Tsujita, the process of improvement is time well spent. “I thought this is a really good exercise for me to train my body in awareness, in musical expression,” she said. Scott Allan Orr, a U of T alum who composed a piece for the carillon named “everything that rises must converge” for the 2018 Service of Remembrance, also found music from the instrument to be a means to convey a message. The inspiration for the composition arose from a conversation between Orr and Lee about the “various ways in which bells are interconnected with wars and memorials,” wrote Orr in an email to The Varsity. Lee played the premiere of Orr’s piece from the Soldiers’ Tower during November’s Service of Remembrance during the post-lude of the ceremony, and was followed by his students playing solo pieces from several other composers. ceremonies, to celebrate the graduation of students at U of T.